EXO’s V Live-exclusive game variety show, “EXO Aracde,” aired its fifth and last episode on Saturday, which was again filled with fun and laughs. Divided into two teams, the eight members played a game called “chair curling” in which players slide bandmates, instead of stones, sitting on a wheeled computer chair, to the four concentric circle. A poised and focused D.O. sent teammate Suho to the very center of the circle, surprising bandmates. Two other members of Team B were Sehoon and Kai. “You should do curling, really. It’s not too late,” an amazed Sehoon said to him. 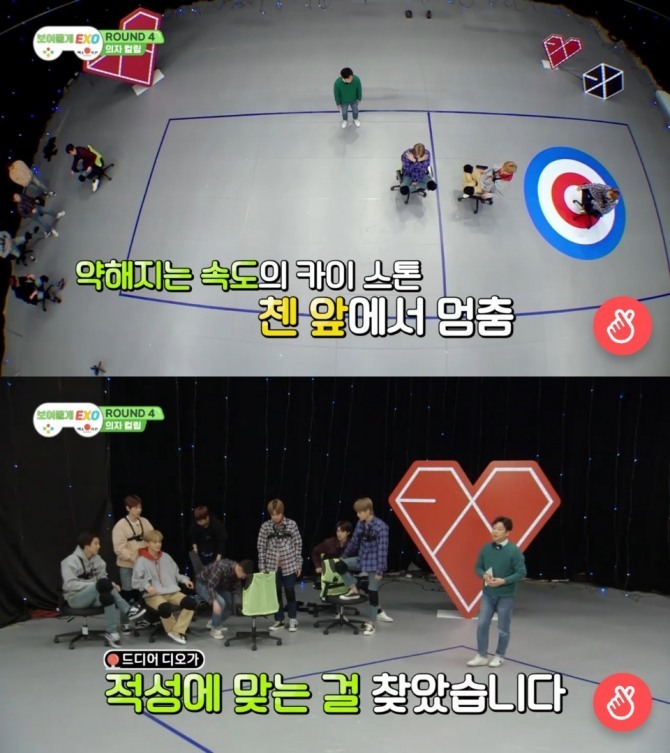 However, Team A, consisting Xiumin, Baekhyun, Chen and Chanyeol, showed an impressive teamwork to put all three “stones” inside the circle, beating Team B by 3:1. Team A was the overall winner when all five rounds of games were over. Watch the final episode of EXO Arcade at https://www.vlive.tv/video/107570. For previous episodes, visit EXO’s V Live channel at https://channels.vlive.tv/F94BD/home. Seven-piece K-pop boy band Monsta X popped on the V app on late Saturday afternoon, shortly after a fan event in Seoul. 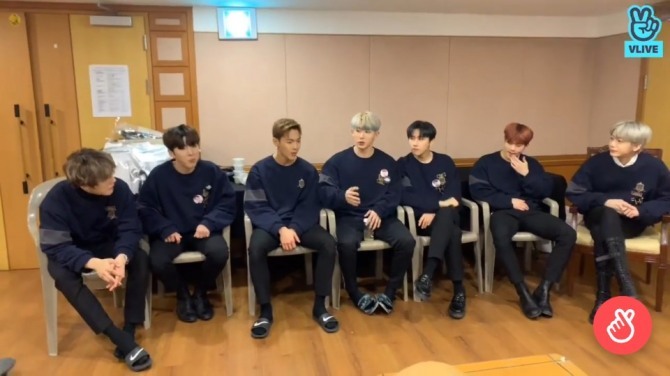 “We just had a fan meeting for 3 hours and 50 minutes,” said Shownu, the act’s leader. “At concerts, we try to show as many performances as possible, but in fan meetings like today’s the focus is more on talking,” he added. Bandmates revealed that the original running time of the event was set at 2 hours and 30 minutes, which was lengthened by one hour on their request. “But it felt short,” Shownu said. Hyungwon thanked fans who came over to meet them and apologized to those who couldn’t for holding the event only in Seoul. Watch the broadcast at https://www.vlive.tv/video/107740. 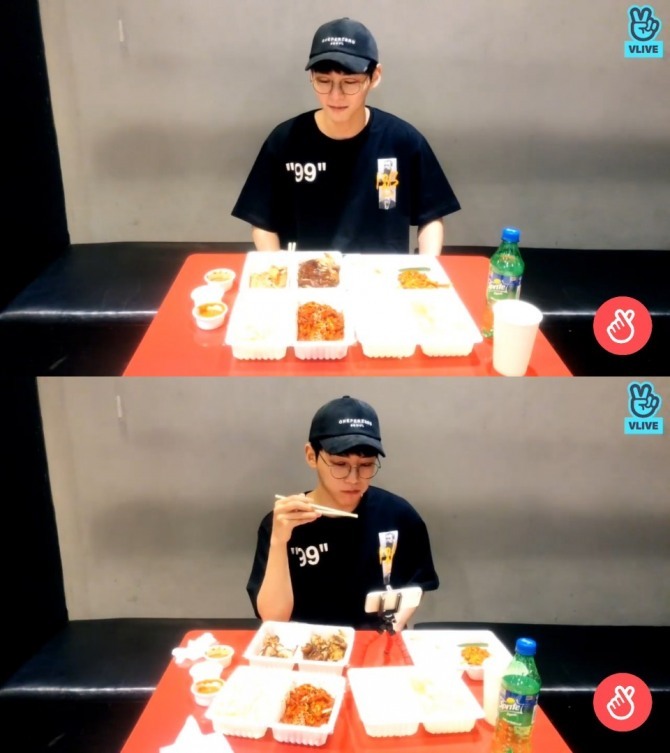 Yoonsan of boy band Hotshot went live while eating braised pork feet, which he said was high in protein. “You don’t put on weight by eating jokbal and bossam, because it’s protein-high,” he claimed. Jokbal is a popular Korean dish of pork trotters cooked with soy sauce and spices, while bossam is steamed pork, usually eaten wrapped with lettus, cabbage or kimchi. “Will I eat this all alone? Of course!” said Yoonsan, looking at the food in four takeaway containers. “To be honest, I had pork cutlet just two hours ago. I like this kind of broadcast, it’s so fulfilling! I want to do it again,” he said. Watch Yoonsan’s live eating show at https://www.vlive.tv/video/107692.